One thing that has always bugged me about address book printables is that they don't have the alphabet tabs on them. I always end up labeling them with sticky tabs that usually fall off after a few months. That is why I decided to include tabs on these. To put your address/contacts portion together just print out 13 of these pages. Then on each page cut off all but one tab, leaving a different tab on each page. You can cover the tabs in clear tape or laminating paper to make them stronger. 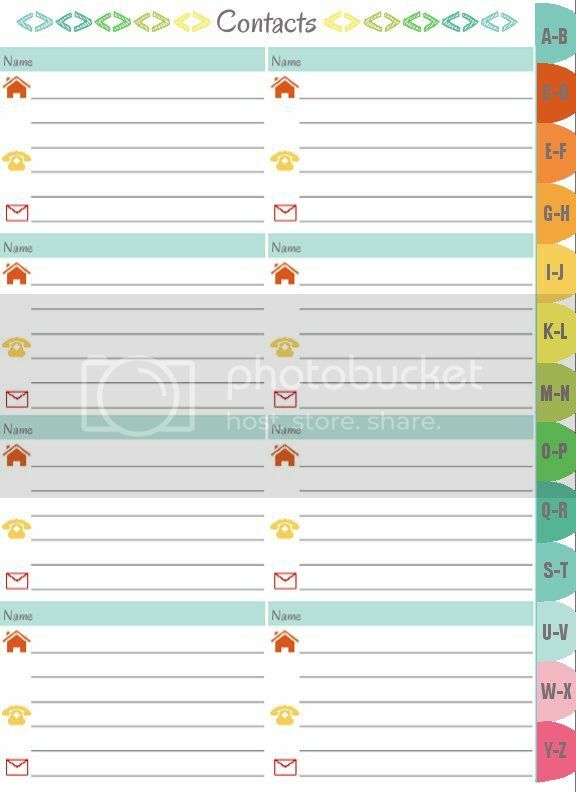 I also included a link to the contact list without tabs so that you can print extras or if you just don't want to deal with the tabs. These are great, I have to have everything organized. Thank you Christina! So glad you enjoy them. All your printables are great, but these PDFs seem fuzzy. Is it just me?? I had the same issue. Every other printable is crisp and beautiful, but this one is fuzzy. yes mine or fuzzy too ....don't know what I am doing wrong ? Your home binder downloads are amazing. exactly what I needed, but never have the time to make (which is why I need them!). For 2014 I want to be more organized. This helps so much. Thank you! I love all your printables, but would like to make them in other sizes (to fit my filofax) and colors (to match my color theme). Would you mind sharing how you make them or what program/software you use to make them? Thank you. Do you have a password log that would be a type of file we can type in? with URL's it's easier to just copy and paste. Just a thought if you do not already have this created in excel or another type of file we can type into. I tried to download the one without tabs and it came out blured. Not sure if it was me or not. The Clean House and Dates To Remember came out great! Thanks for these! Love the colors!